Revolut, which launched in 2015, bills itself as an alternative to banks and offers app-based current accounts. 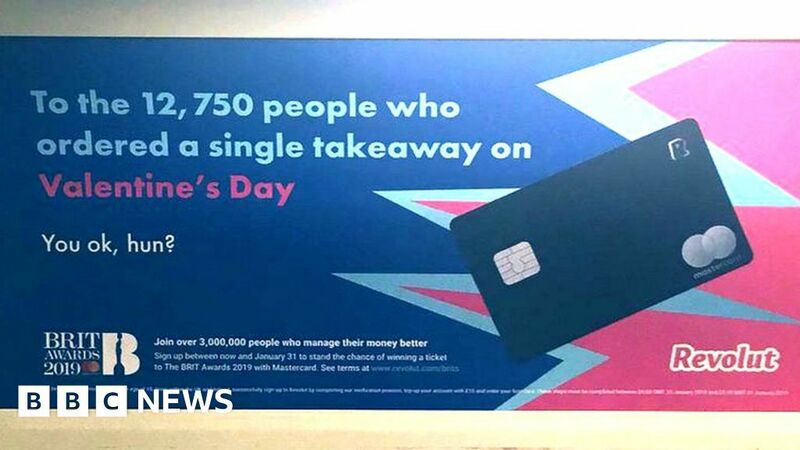 But it sparked complaints with a “spoof” advert addressed to people who ordered a takeaway meal for one on Valentine’s Day last year. Revolut has apologised for the advert, described by critics as “intrusive” and “tone-deaf”, and said it did not mean to poke fun. It has also admitted that the figures in its campaign were fictitious and should have been labelled as such. I’m A Celeb: Will it work with Holly Willoughby instead of Ant? November 18, 2018 Comments Off on I’m A Celeb: Will it work with Holly Willoughby instead of Ant?